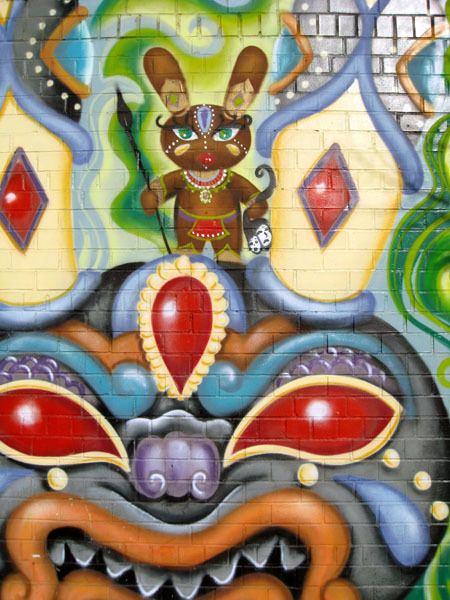 I cannot believe with as many times as I have walked by this mural (on McGuinness Boulevard just north of the BQE) I never noticed that this seemingly cute little bunny was a headhunter. Or maybe he (?) is the Cthulhu bunny and instead of candy this playful little scamp leaves shrunken heads in the baskets of unwitting children? Given the way some children behave nowadays, I can only hope so. This horrific little hare is yet more proof that the neighborhood we call Greenpoint yields its treasure in the most unexpected of places: in plain sight. I’m surprised that one has lasted so many years! If you want specifics, it’s a painting of “Dunny“, a designer toy platform that several graffiti artists have gotten behind in the past.